Let’s face it, in the last year or so, travelers have been talking more and more about Argentina: the best place for nightlife, the best place to visit with a weak American dollar, the best place to see before it’s overrun with tourists. Not one for putting things off too long — and with winter just around the corner — I booked a flight to Buenos Aires to find out first-hand what all the talk was about. 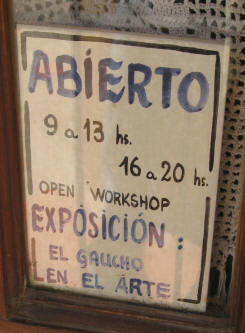 I landed in Buenos Aires on a Friday morning after an overnight flight nonstop out of JFK. I grabbed my suitcase, waded through the crowd of drivers gathered near the airport exit, and hopped into one of the yellow cabs waiting patiently on the street. About half the price of a car service, my ride in a slightly beat-up taxi cost about 75 pesos or US$25 (the exchange rate has been hovering around 3-to-1 for the last few years). 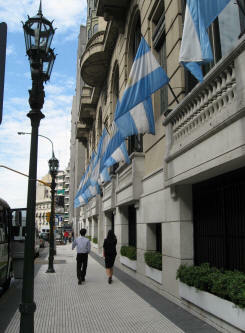 Which brings me to one of the main reasons Argentina has emerged as a favored destination. 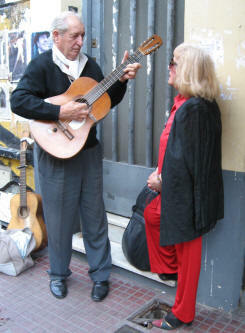 As is usually mentioned when speaking of post-financial-crises Argentina (in 2002 the Argentinean peso was unpegged from the dollar, causing much of the nation’s wealth to be wiped out overnight), Argentina is an extremely affordable place to visit for foreigners. With a recovery only now beginning to unfold, Americans should expect to pay about a 1/3 (and even better for the British and Europeans) for everything from lodging to food and drinks. After about 20 minutes, we turned off the highway and wound our way through Buenos Aires’ outer barrios, finally arriving in the neighborhood where I’d be staying for the next four nights: Palermo Soho. 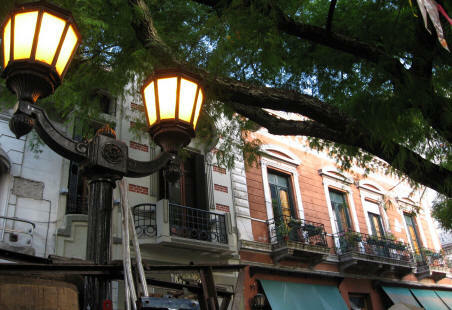 With its young, stylish population, Palermo has recently emerged as the “in” neighborhood, home to some of the city’s best art galleries, shops, bars and restaurants. A few weeks before my trip, I consulted my borrowed Lonely Planet and did a quick web search and found Hostel Giramondo (located at Guemes and Santa Marie de Oro — about a 10 minute walk to the center of Palermo Soho). Even amongst the leafy streets and pastel colors of the eclectic neighborhood, the hostel, with it’s lime green façade and imposing iron doors, is hard to miss. Inside the converted Victorian, the hostel has a subterranean bar (which comes alive on the weekend with a surprisingly large number of locals stopping by), a rooftop terrace, kitchen, and about twenty rooms, accommodating up to four people each. The hostel is run by a pair of brothers and the young staff running the front desk are likely to hang out in the lobby with you during downtimes and play a few songs on their guitar or grab a drink with you. After arriving I was told my bed wasn’t ready yet, so I left my bag and walked down the street to Plaza Serrano — the center of Palermo Soho — to check out the mix of funky, hip shops that line the streets south of the plaza. The shops in Palermo sell everything from ultra-modern home furnishings to casual clothing and many are located in converted warehouses that have been given a sleek, tropical makeover, which makes the area feel like Soho (New York) crossed with South Beach. I’d barely gotten any sleep on the overnight flight and the glaring afternoon sun was quickly depleting my energy, so after lunch I settled in for a long nap back at the hostel, awakening several hours later to find a British guy named Ian reading in the bed below me. “Good mornin’, stayin’ with us long?” he asked, looking up from his book. He laughed. Turns out Ian and his friend had arrived a few months back to open up a bar down the street, and since the room was so cheap they’d decided to stay there until they opened shop, which meant sleeping in a bunk until at least July. We talked for a bit and Ian recommended that I check out the bar in the basement. So after a quick shower I headed downstairs, intending to return soon to my bed to finish up on all my lost sleep. But as I quickly learned, in Buenos Aires the bars don’t begin to fill up until midnight, so when midnight rolled around I suddenly found myself drinking two-dollar Coronas to a mix of reggaeton, samba and hip-hop music blaring from two large speakers hung from the stone walls, and making friends with some visiting Peruvians and a group of Argentinean students who lived in the neighborhood. So much for the early evening. I woke up the next morning after heading to bed around three, ate a quick breakfast, and headed down Avenue del Libertador through the posh neighborhood of Recolata on my way to the famed Recoleta Cemeteria. The cemetery is one of Buenos Aires’ most famous landmarks and it was crowded with visitors, but as soon as I made my way past the courtyard near the entrance, the crowds dissipated and I found myself alone, wandering along the maze-like paths underneath the hulking, elaborate mausoleums erected near the turn-of-the-century as resting places for the country’s wealthy elite. 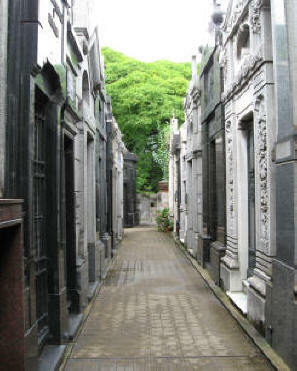 Here you’ll find presidents, generals, renowned scientists, and most famously, the tomb of Eva Peron. I was amazed as to how quickly two hours passed by as I wandered around this strangely serene oasis located in an otherwise hectic section of the city. A short walk from the cemetery through the neighborhood of Retiro is Plaza San Martin; a lush park that sits on a bluff overlooking the part of the city that slopes downwards to the river’s edge. 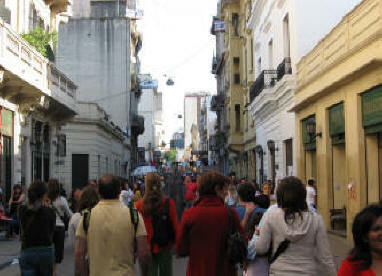 Located between the train station and the downtown corridor known as Microcentro, San Martin acts as the unofficial gateway of Buenos Aires. 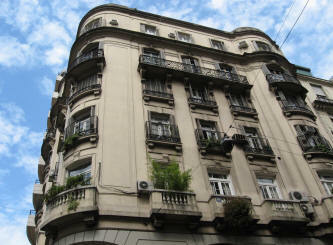 Surrounding the park are some of Buenos Aires’ most impressive buildings. Built in the beau arts and art noveua style, these old government buildings serve as excellent examples of the influence that the French culture had on the city a century ago. 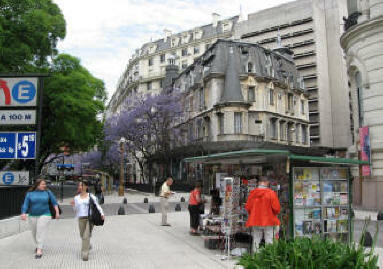 San Martin also marks the beginning of Avenue Florida; the giant pedestrian mall that juts southwards through Microcentro. Here you’ll find everything from high-end shops selling fine leather goods to street vendors hawking mate cups and parkas. The street tends to be overrun with visitors, so I quickly made my way several blocks down to the Galerias Pacifico, a resurrected warehouse that was converted into an upscale mall. Adorning the vaulted ceiling are giant murals evoking the artwork seen in a European cathedral — not exactly what one expects to find in a mall. Outside I caught a tango show by a group of street performers — one of many along the street — and then I made my way to the iconic obelisk that sits at the Plaza de la Republica before heading back to the hostel. cashier waiting for the transaction and exchange of receipts to occur). jazz, solo guitar, opera, Latin percussion, and traditional folk songs. That night I met my friend Fabrila for dinner at Milion, a well-known restaurant in Recoleta (Sante Fe and Parana). We entered through a non-descript door on the street, walked up a flight of stairs, along the empty bar, and finally through a large set of French doors that opened onto a giant stone terrace that towered imposingly over a large, pebble-coated patio. We took a seat amongst the lush landscaping and towering white buildings above us, and we both ordered a local rice dish containing some of the largest crawfish I’ve ever seen (they are abundant in the nearby delta) and Argentinean wine from the Mendoza Valley. With drinks and an appetizer, the meal came to a total of only about US$40. For my last two nights in Buenos Aires I booked a stay at Che Lulu, a small boutique hotel on Pasaje Emilio Zola in Palermo Soho, where, for US$40, I was given a small room with two single beds and a shared bathroom down the hall.I read that there are many flats you can rent for a week at a time in Palermo, but for the price of the hotels — and their quality — it’s really unnecessary. Here, I had a helpful staff, free breakfast and internet, and, as was the case at Giramondo, it was a great place to meet other travelers. The next day I wanted to take a day-trip to get out of the city. After consulting my Lonely Planet, I decided on San Antonio de Areco, a small town about a two-hour bus ride west through the Pampas (the fertile lowlands surrounding Buenos Aires). As I waited for an hour for the bus in the city’s chaotic bus station, I struck up a conversation with an old woman who was seated to my left. Given my limited Spanish, the conversation was pretty one-sided until a man to my right who looked like he played soccer professionally joined in. As far as I could make out, we were talking about the lack of church participation and a general dislike for city life. I was feebly attempting to protest, “Me gusta la ciudad!” when a bus pulled up several spots over from where mine was supposed to arrive. After consulting my ticket, the old woman ambled over and spoke with the driver. She motioned for me to get on the bus. She and the man smiled and waved to me as I got on. I waved back and slunk back into my comfortable, well air-conditioned seat for the short ride into the country. We arrived around two in the afternoon to the outskirts of town, which, after entering, I realized was right in time for siesta. After some wandering I found an open café where two dogs were sleeping near the entrance. After a leisurely lunch I walked through Plaza Ruiz de Arellano — a small park at the center of town — on my way to Rio Areco, the river from which the town derives its name. As I walked back I could tell that San Antonio was beginning to wake up, which, even at its most active, maintains a sleepy feel. I darted into a nearby silversmith shop where the owner, an affable third-generation silversmith, showed me around his shop. I picked up a mate cup and a llama sweater from a second shop and then I stopped at one last store near the center of town where the owner, Analisa, insisted I try some of her mate tea before she drank it. Surprisingly, even on as hot of a day as it was, the tea was refreshing and flavorful. I ended up buying the last of my gifts here and got back to the station near dusk, just in time to catch the last bus back to the city. When I arrived back from San Antonio, a message was waiting for me at the desk from some friends from Ecuador inviting me out that night to the neighborhood just north of Palermo Soho: Palermo Hollywood (I know it gets a little confusing). Fitz Roy, just a short walk north from the hotel, is the neighborhood’s main street and it’s lined with numerous restaurants and bars that are a step-up in quality from those found in Soho. 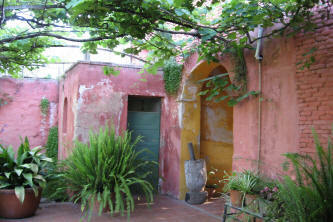 Though Italian restaurants seemed to be the dominant style, I also saw French, Turkish, Japanese and Brazilian. We met at a bar named Uniglo where we ordered Mojitos and listened to a mix of eighties and hip-hip mixed by a DJ who was suspended on a small platform hanging precariously above the bar. The next morning I found that the sore throat I had been neglecting for the last week had worsened and the lack of sleep over the last few nights had started to wear on me. I spent the day on the phone working out arrangements for my flight to Santiago, Chile, for the next day, which I somehow was able to procure despite barely hearing a word the Expedia agent was saying due to the poor connection. Unfortunately, the only flight I could get was 5:30 a.m., so after making my way back to the hostel and a light dinner I headed to bed around 10, just when most people were heading out for the night. As I dozed off I could hear cheers for the Argentina versus Columbia match that had just started. I wished I could have joined in and watched. “Next time,” I thought, for now it’s time for some much needed sleep, and next, Chile, to continue on with this amazing trip.